There was once an insurance salesman who would go door to door selling insurance. Well one day he happened upon an old farmer. As he approached the farmer to make his sales pitch he noticed an old hound dog laying on the porch to the right of the farmer. As the salesman began to speak the hound dog bellied out as if something were wrong. The salesman at first ignored the dog, but every time he tried to say something to the old farmer the dog moaned out louder and louder. Finally the salesman asks the old farmer. The Point: We all have our own nail that we may complain about on a daily basis. Your nail could be financial issues, employment problems, spiritual confusion, family drama, relationship woes, etc. Whatever your nail is KNOW that you will not move until the hurt is bad enough to make you move. Thing is you don’t have to wait til the pain gets unbearable. Thank God today for not allowing you to be nailed to that cross. In Jesus name, let us get rid of our nails (issues/relationships) that are hurting us, making the pain “unbearable.” Amen. God gave us time for a reason. Stop wasting God’s time. 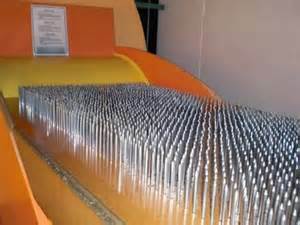 Get off of the nail bed. Get Up!